Chipotle Mexican Grill has a fun little game that you can play and you get a reward at the end! 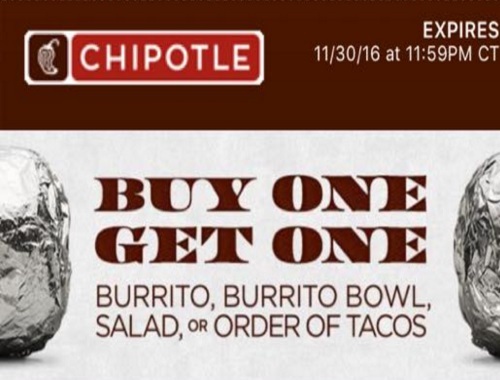 Play the game to score a BOGO Buy 1 Get 1 Free card for a burrito, bowl, salad of order of tacos! The Chiptole promotional code is sent via text message with a QR code to show in-store when you order. You will receive up to 4 msgs per request. One coupon per customer. While quantities last. The free coupon is valid until Wednesday, November 30, 2016.